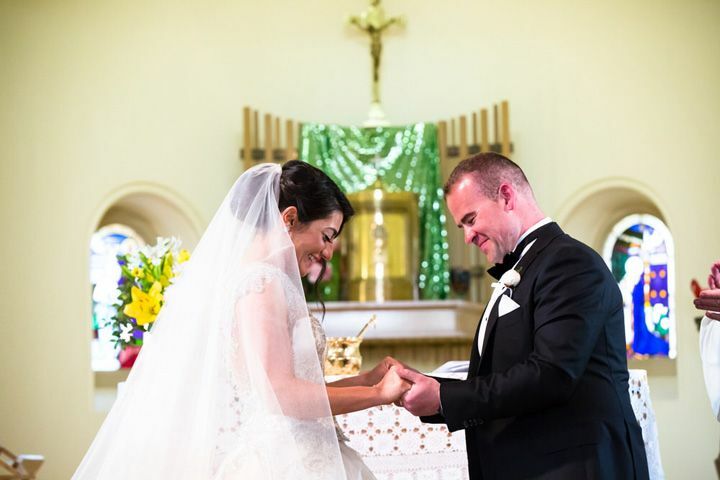 For a couple that hit it off right away, the romantic Country Estate Wedding of Antoinette and Adam is full of as much fun and sweet romance as you could hope for! 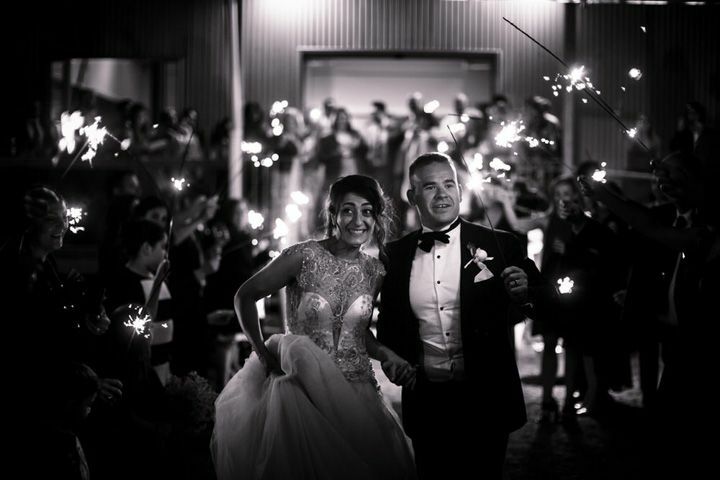 PixRay Photography shared their album with us for inspiration for a classic, simple, and romantic wedding. 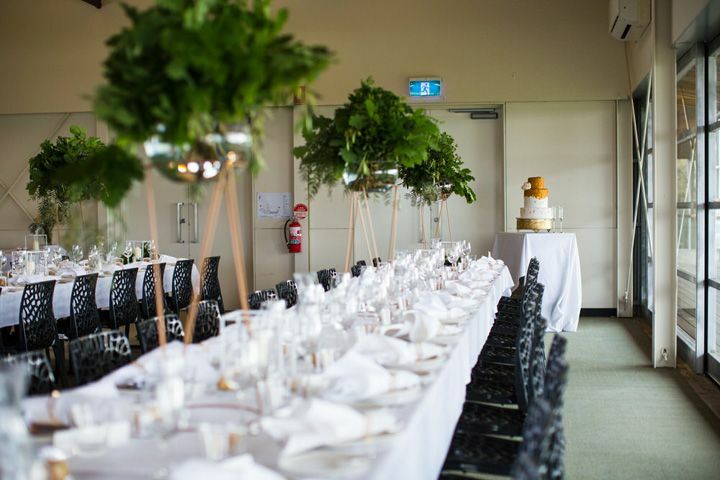 The couple says that they didn’t want to spend too much time over-designing their wedding and would rather compliment the gorgeous scenery at their venue. 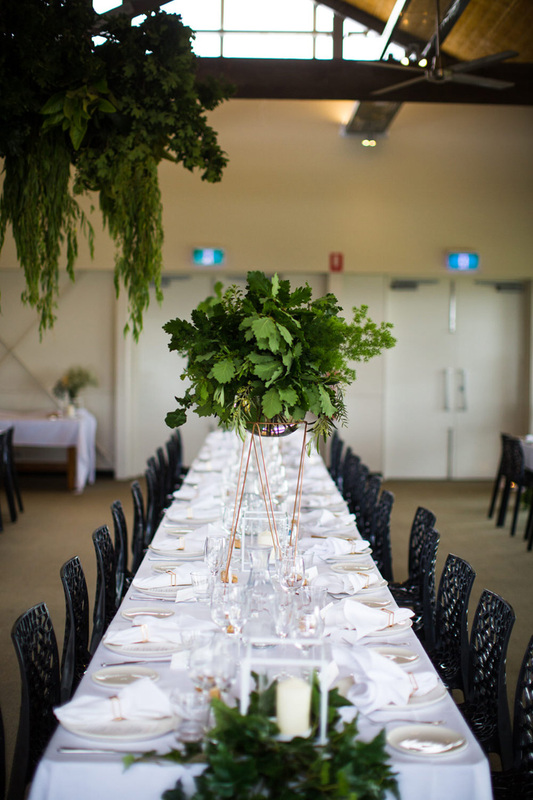 So for their reception after their traditional church ceremony, they kept clean white linens, gold table details, and greenery arrangements. 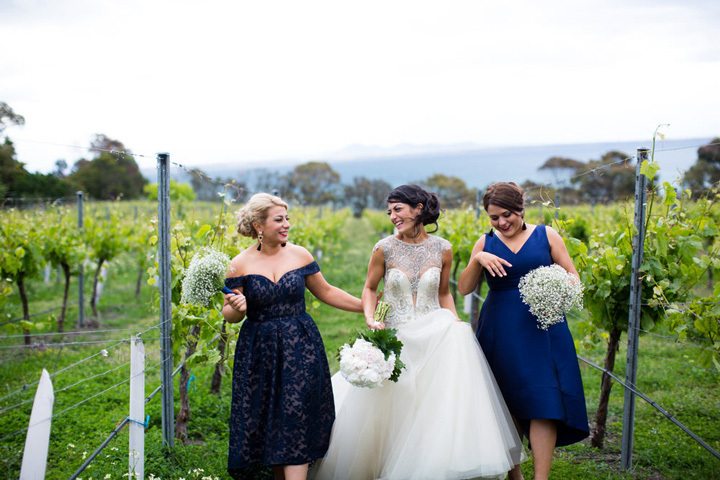 They took full advantage of the beach, meadows, and vineyards that surrounded their venue – none of which needed any decorating to look picture-perfect! 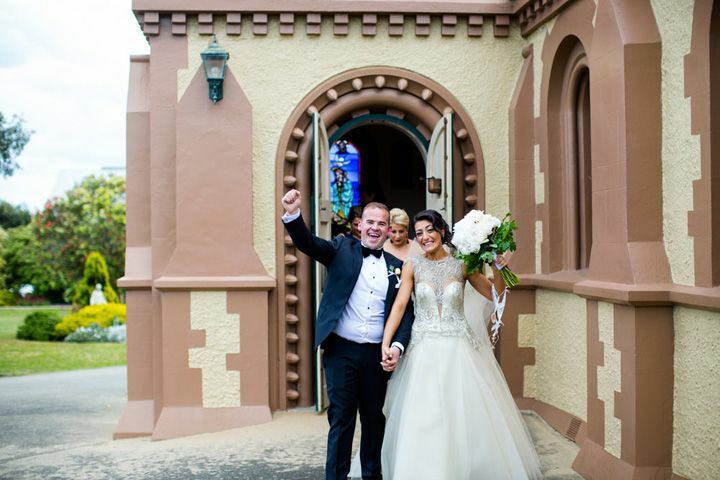 Antoinette is jaw-dropping in her custom gown made by Elide at Bonita Couture Melbourne. 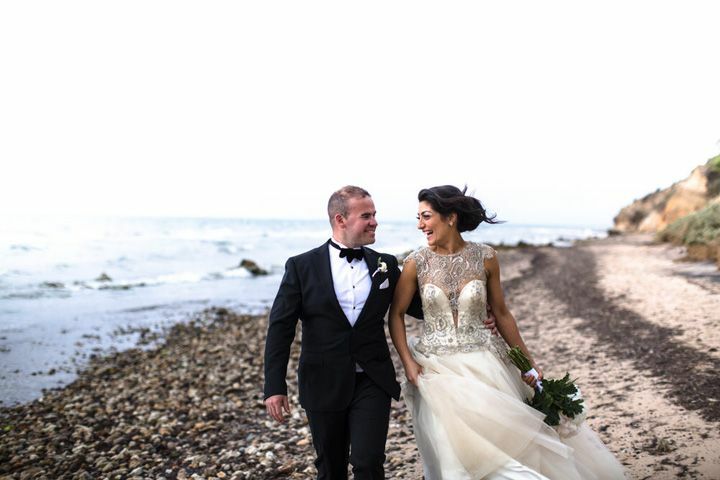 You have to look at the amazing hand-beaded French lace bodice paired with a heavenly skirt made up of 75 meters of Italian tulle, all in shades of antiqued white and cream. 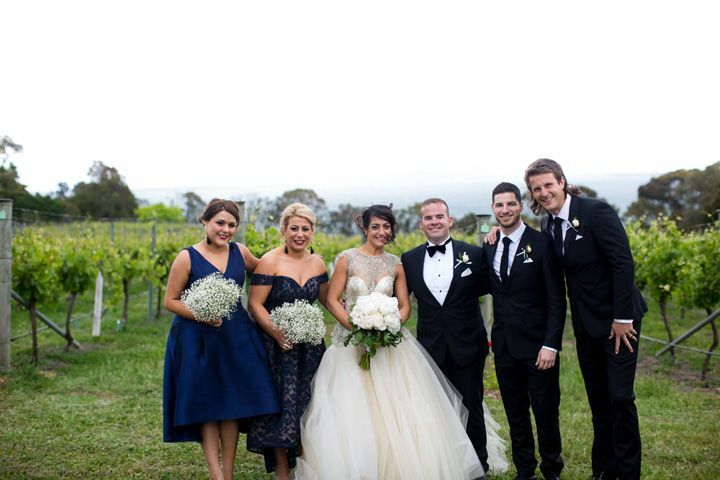 Her supporting ladies are in mix-and-matched dark blue gowns – I LOVE the sparkle in that dress, don’t you? 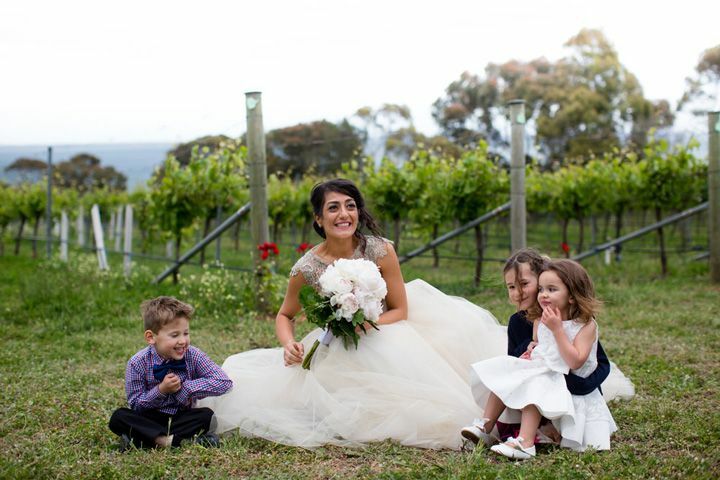 And what a wonderful idea for the bouquets – nothing but baby’s breath for the bridesmaids and pure white roses for the bride. 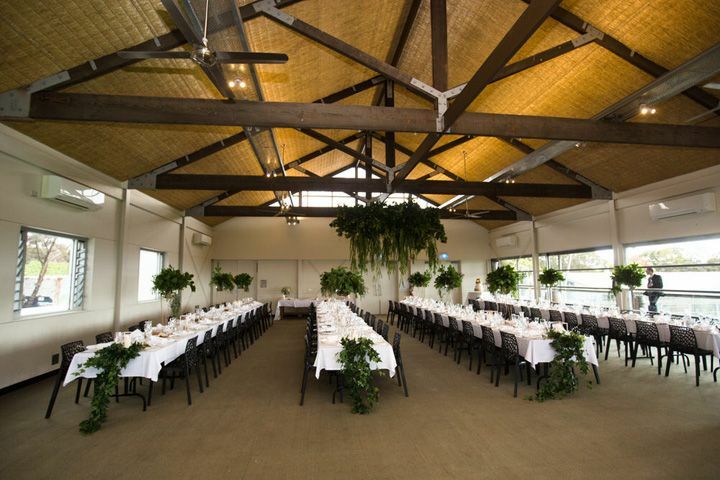 Other design points of interest include an impressive greenery display draped from the ceiling to create a cascading waterfall effect overhead. 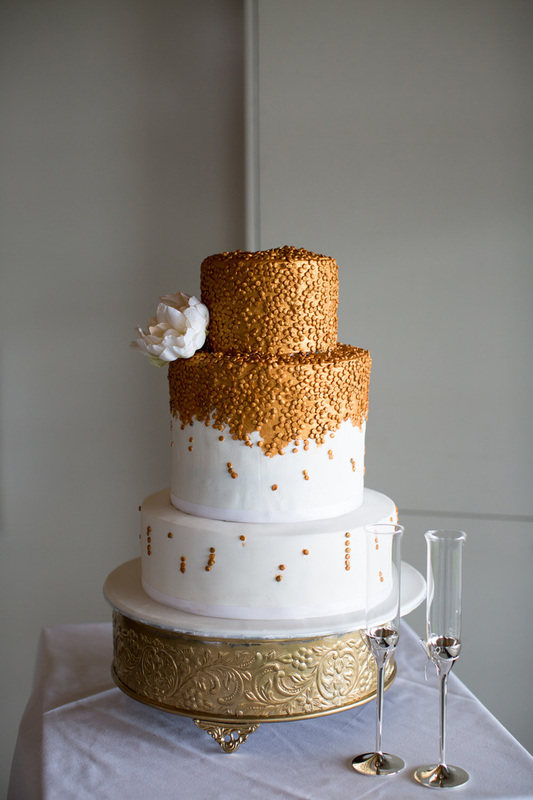 Then there’s the amazing, unique cake by Ministry of Cakes that catches the eye with a gold “beaded” texture that trickles down the otherwise crisp-white tiers. 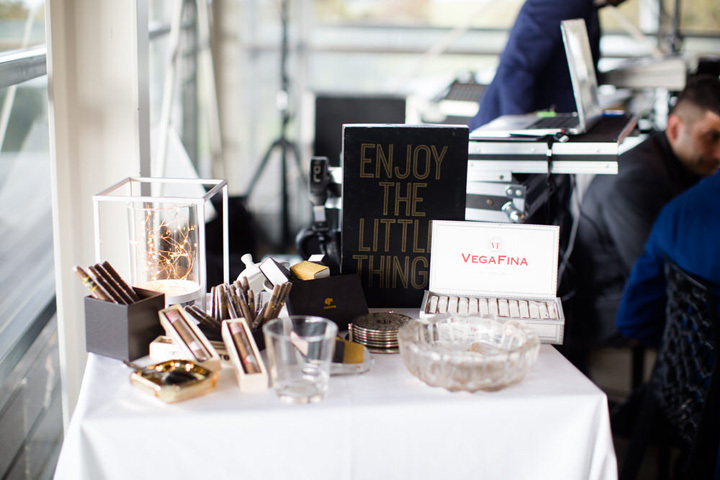 There was a table of treats for guests in the form of cigars and sweets with a sign reminding them to “Enjoy the Little Things.” And for the young guests, the bride’s sister created a coloring and activity book made out of images of the bride and groom! 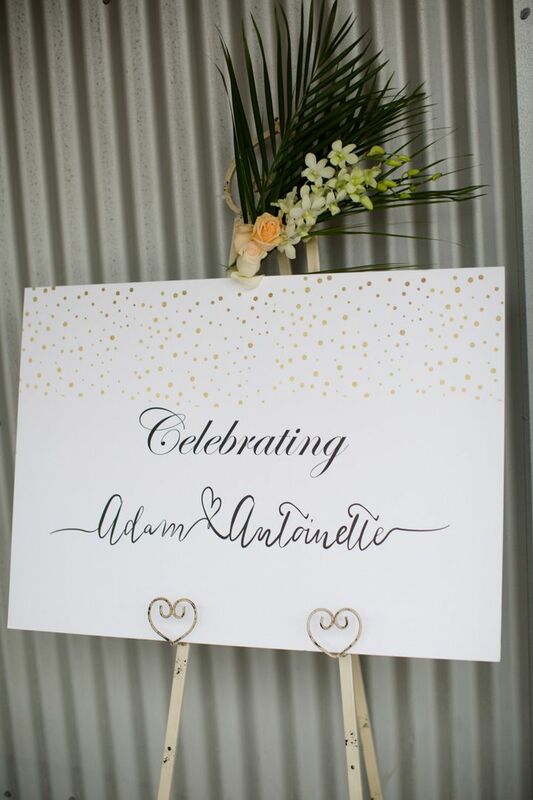 What a FABULOUS addition to make all of the guests feel welcomed at the celebration. 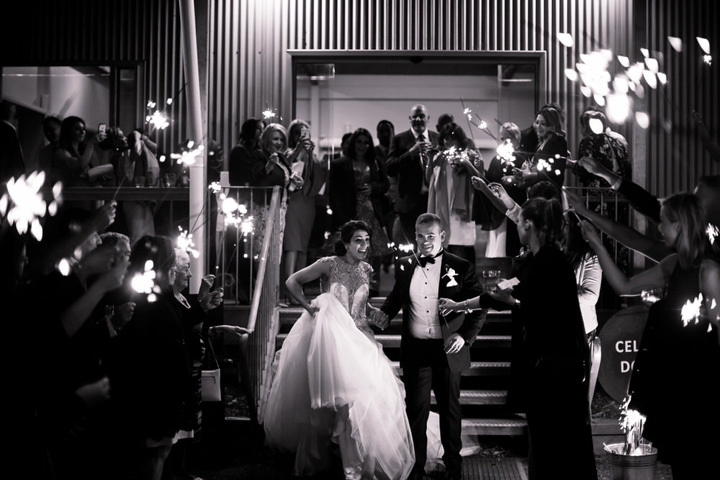 We hope you enjoy today’s real wedding photos as inspiration! My friend Laura met Adam online and instantly knew she had to introduce him to me. “There’s something about him that makes me think the two of you should meet”, she said, and the more I ignored her the more she insisted. Eventually Laura invited Adam out to drinks without telling me and, although at the time I could have killed her, I’m so happy she did. Adam and I hit it off instantly. He was funny and sweet and was surprised to learn I enjoyed watching a lot of the same things he did, including sports. We had so much in common, we could have spoken all night. He asked me out and our first date turned to a second and third and as long as he kept me smiling I kept saying yes when he asked. I don’t know what number date we are up to now but we still go on date nights even now, and he still makes me smile. We were in Rio De Janeiro as part of our trip to South America, Adam and I had travelled there for the World cup in 2014 and were lucky enough to share in the experience of watching the world’s biggest sporting event. On our last night in Rio, Adam suggested we go out to dinner to farewell the beautiful city. Little did I know that he had organised for a private moonlight picnic on Ipanema beach. Lanterns, cheese and wine overlooking the stars and the lights of Rio’s favela it was perfect… almost perfect. Except that Adam got us lost on the way. We walked around for almost an hour in what I thought was a quest to find the beachside restaurant that Adam had booked… all the while not knowing there was no restaurant or reservation and that Adam couldn’t find the picnic set up he was trying to surprise me with. I had suggested that we give up and go back to the main area of Ipanema, Adam was determined and grabbed my hand to lead the way. He thought getting to higher ground would help so we climbed up a hill face on the beach where eventually we reached the top. The moon was bright and cast a beautiful light over the waves on the beach that night and the lights of the hundred cliff face homes across the beach looked like fairy lights from a distance. It was a beautiful view, breathtaking. By getting lost we found the perfect spot to capture that moment. We did eventually find the beach picnic. Always laugh and talk talk talk! We try to not take things too seriously, and attempt to talk things through as much as possible. Our commitment to ‘us’ is life long and we both know we have to work on it every day, we just try to have as much fun as we can along the way. 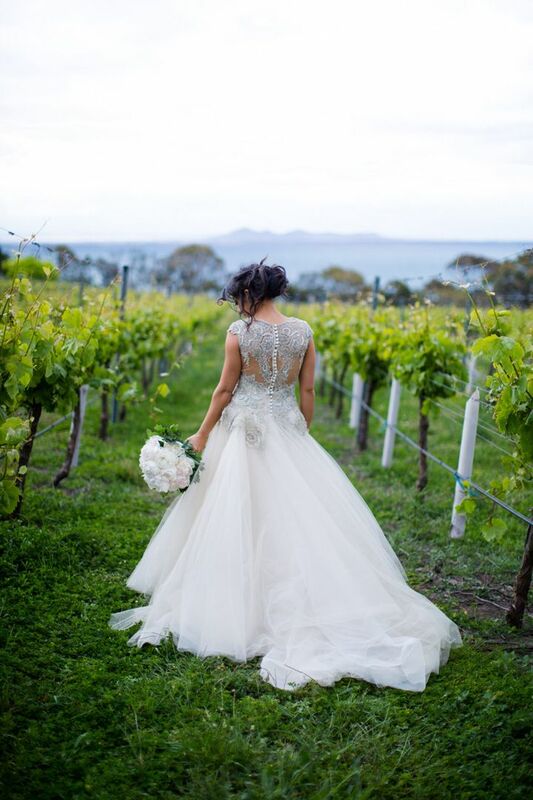 The amazingly talented Elide at Bonita Couture Melbourne created a one-off gown made from over 75 meters of Italian tulle and hand beaded French lace. With an intricate silver beading and a metallic silver bullion thread embroidered in the weave of the lace hand appliqued across the contoured boat neckline and bodice, the gown would catch different shades of light and appear to have both warm and cool tones. 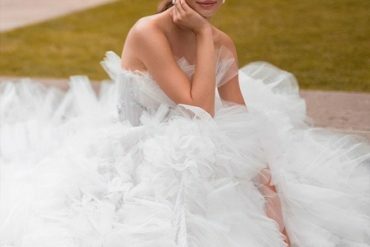 The fine Italian tulle cascaded softly into a pale gold and ivory full skirt that added decadence to the gown, a hint of a modern element was the barely there back. 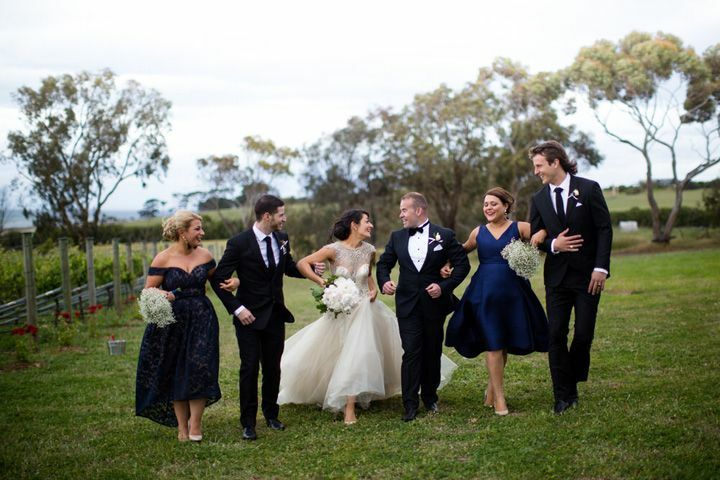 The dress was completely backless, dropping quite low to add an element of modern design but tastefully under the hand appliqued lace and silk buttons. I don’t know if I loved the front or the back of the dress more! The decision was made when I put the dress on, I felt like a bride for the first time. 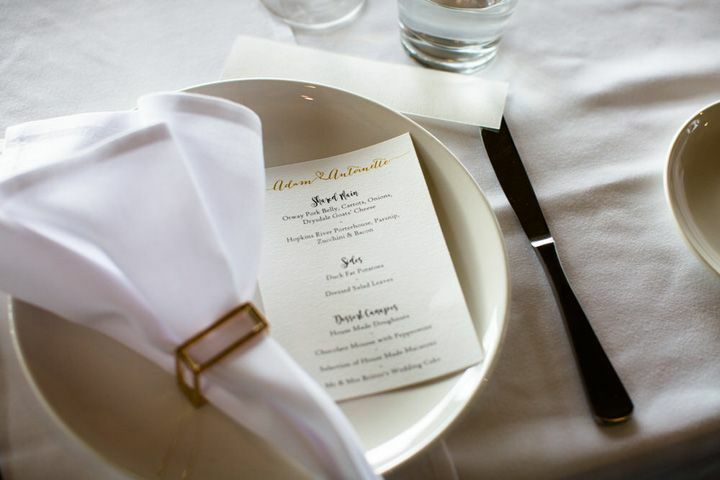 It embodied everything I was looking for, classic elegance, decadence and a hint of a modern bride. By far the look on Adam’s face as I entered the church. It was pure happiness and love, as if it were almost exploding out of him. 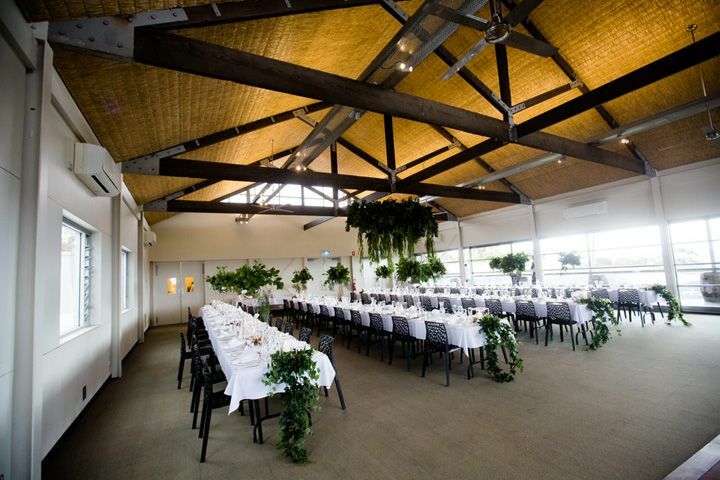 Later that day Adam and I stole a moment to sit in our reception venue before the celebration started and just have a quiet minute to ourselves and just breath it all in, we were both so happy we did that. Our 9 little guests were greeted with a specially designed Adam & Antoinette coloring book, produced by my sister. 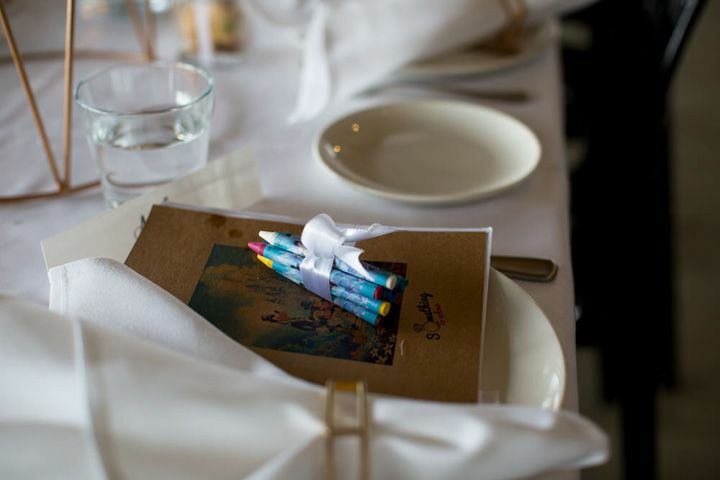 The Book and a collection of crayons wrapped in gold silk ribbon were placed on each of the nine children’s plates just in case they wanted something to do. “Help uncle Adam get to the church” (drawing maze), a wedding themed word find and a “colour the wedding cake” page were all lovingly created for us by my amazingly talented sister Lina. The kids loved the activities and coloring in and the parents appreciated them, too. I don’t know that I would change anything. We really did have a beautiful day, and as wonderful and happy as it was married life is even better!!! We are both loving where we are now. On the day of your wedding things will go wrong, it’s a fact. Just let it all go, breath and take in all the love of the day. Love from your family and guests and the love you and your partner have for each other. That’s why you’re all there in the first place! 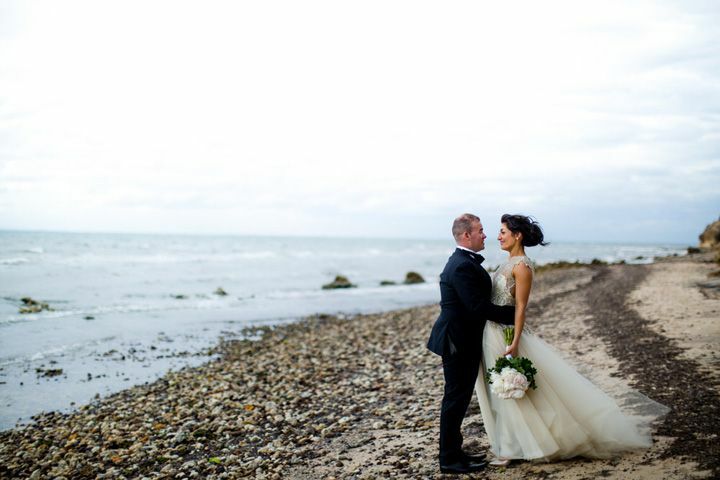 I like these photos with kids and beach, great wedding. 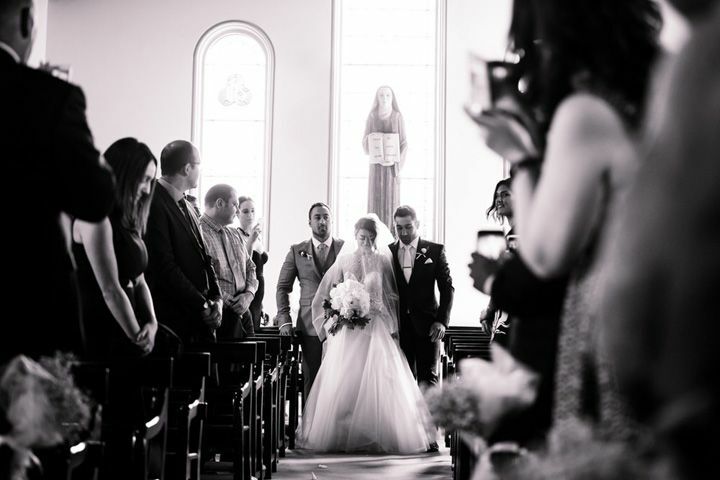 I like this wedding pictures you share this…..